Sid Meier’s Civilization is one of the most-loved franchises in gaming, particularly among those with a historical bent, even though it doesn’t provide a realistic narrative of history. The latest iteration in the series came out a few months ago and adjusted many aspects of play for better or worse depending on whom you ask. 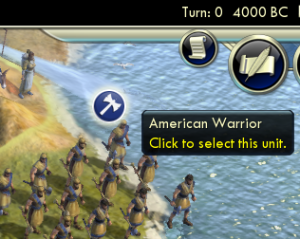 The lead designer for Civ 5, John Shafer, once said that if you took the history out of Civilization, you’d still have great gameplay – it just wouldln’t feel as familiar. Now, he said this in a kind of defense for why Civ isn’t historically realistic, but I want to unpack his statement a bit and challenge the underlying assumptions. Would Civilization still be great gameplay without the history? First of all, where is this history? I loaded up the game the other day and chose a random civilization instead of hand-picking my leader. I ended up with Washington, Leader of the Americans. The window that popped up to tell me this spoke of how the United States arose in the 18th century, etc, etc. It then said, it’s 4000 BC, can you build a civilization to stand the test of time? I chuckled. Here was a clear example of how history provides only a context for the game. When I look at the map in 4000 BC and see an American warrior, it does feel familiar but it is far from a recreation of the past. Another area in which history provides perhaps only a design framework is that of the social policies, Civilization V’s new governmental system. These policies encompass various different traits of governments and fitting bonuses for each. For example, one begins the game with the option to specialize in Tradition, Liberty, or Honor. Each is designed to provide bonuses to a particular playstyle – Tradition for small empires, Liberty for expansive ones, and Honor for those with militaristic aims. It is only after reaching different historical milestones (Medieval Era, Renaissance Era, etc.) that more options in social policies open up. 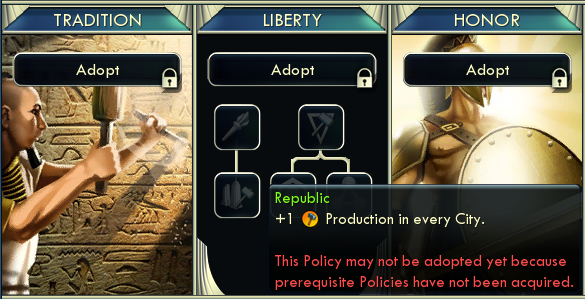 It is not until much later in the game that the Democracy policy is available, for example. This kind of system is based on a linear view of history that sees human progression march along a timeline, starting with primitive forms of government and leading up to much more detailed and nuanced systems. At first glance, we may find it familiar that Monarchy is one of the first options, while Democracy is buried deep in the policy trees. But, actually, democracy was present 2500 years ago and there are still monarchies today. History is more complicated than this model of government makes it seem, despite the familiarity present in its design. I should say here though that this social policy model, new with Civilization V, provides much more freedom of choice than its predecessors. Although democracy is deep in the tree, Republic and Representation are available early on if one chooses to prioritize Liberty. Slavery, however, is not even present as an option anymore. 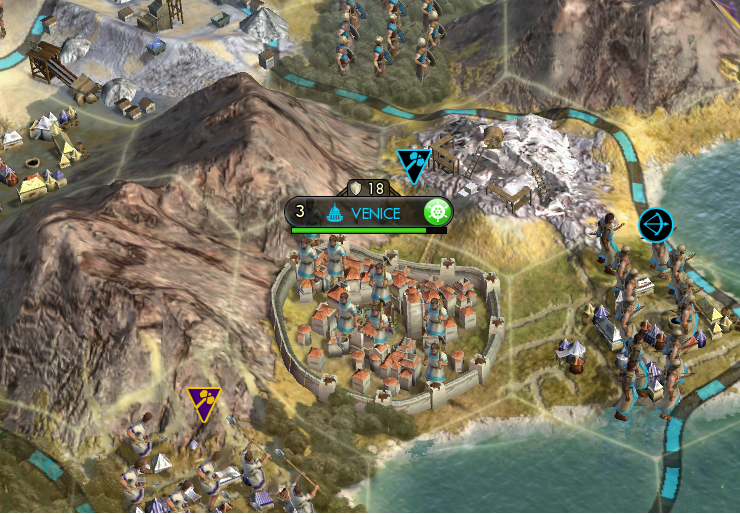 Civilization V changed many aspects of the series, but one feature in this iteration is completely new – that of City-States. These cities on the map are individual states (as you may guess from their name), but they do not compete to win the game. They exist to provide diplomatic and physical benefits to those countries who ally with them. Although their gifts of resources and military units are helpful, the City-States’ real power exists in their diplomatic ties. A player may be able to acquire resources elsewhere, but the diplomatic repercussions of abandoning, or worse, making a puppet out of a city-state, even one you’ve never been allied with, have the potential to be traumatic, while the friendships one builds up over time may dissuade a larger and more dangerous civilization from attacking you. City-states themselves do not change over the course of the game (6000+ years). They acquire a few extra tiles of land, but aside from that, they never progress. Here, again, history provides simply a context for a gameplay mechanic. This one, though, is less familiar to us than the others. What city-states can students name? When I teach Greek history, the concept of a city-state is typically new to them. Even to one familiar with the concept, it is somehow more difficult to reconcile Budapest or Venice as a city-state in the modern age than it is to see Washington in 4000 BC. The mechanic of a city-state in the game feels a bit unbalanced and somewhat shallow. Is that because it is a poor mechanic or because we as players are unable to give it meaning from a familiar context? So then, we have two extremes. Either, something is familiar and we gain some pleasure from playing it as I do when I am Washington in 4000 BC, or something is unfamiliar and it is more obvious as only a mechanic in the game and lacking in a depth of meaning. Somewhere, there is a line that is crossed where history is no longer part of the play, but only a framework. I think this is what Shafer missed in his statement. Part of the reason Civilization’s gameplay is so great is because part of the play is history. The pieces we move on the board are nuggets of real history, even if the narrative at the end of the game is nothing like the one we read in our textbooks. Why is the requirement for a culture victory completion of the “Utopia Project.” Is utopia what enough culture inevitably leads to? Is it problematic that if one builds enough Museums, one has a good chance of creating utopia? What led to that design decision? What is the underlying assumption there? Are we as Americans in search of utopia through a culture of diversity? I’ve mentioned briefly how much of Civilization’s design is based on a linear view of history. How would design change if instead, one took a more Hegelian view of history? What aspects of gameplay would change if the social policies were all available throughout the entire game? In this discussion “history as context” is typically used when historical realism is absent. How can we apply this to present-day society in the real world? What role does history play in our day-to-day operations as an individual/city/country/world? What examples of historical realism do we see around us? What examples of historical context? Which is more powerful? Civilization is a game. Its greatest strength, perhaps, is its ability to take history and make it into a plethora of play pieces. Within this game, history is more than just context. History is the material of play. For more reading on Civilization, check out this post where another of our writers speaks about Civilization IV in the classroom. For me, Civilization becomes more fun when the design framework feels closer to a demonstrable, rational, and arguable view of history. If I can put in an argument why my civilization has the techs and social system it has within the context of an historical possibility, then my civilization carries more weight and meaning with it. But the absurdity of gaining nuclear arms in the 1400s also provides a sense of fun. Both of these types of fun are due to having a sense of familiarity (because of the historical context) but I think the first type is deeper than the second. Where Civilization best serves history for me is through the map. Civilizations in the game rise, grow, and succeed based on what resources they have available to them early on, and improving the map based on technology available keeps its importance, and now with Civ5 city placement is important again for defense. The hooks the Civ series provides for a geographic reading of history are what keep me coming back to play the game, but it is unfortunate that this has never been a feature of importance to the designers. Maybe they think it’s not broken, so they’d rather not improve it. Because the tech tree models something the player already has an understanding of (what sciences/technologies are prerequisites for others and the types of gains each could likely afford) the tech tree makes playing the game easier. There are already so many systems to understand that having an easy mnemonic for what does what in the game is helpful. Most of my problems playing Alpha Centauri stemmed from the technologies not having a clear 1:1 connection to something concrete that I could remember. Great post, I especially like the discussion topics at the end of the post for classroom use. For me, the absurdity of the loss of the historical context (i.e. playing Washington at 4000 B.C. or nuclear weapons at 1400 A.D.) serves to remind us that this is not history as it occurred. I often worry that games such as civilization are teaching the younger generations an incorrect or limited perspective of history. These types of games tend to reinforce a view of cultural evolution as the directional, goal-oriented, linear change in civilizations of Lewis Henry Morgan or Herbert Spencer. If historical games choose to use history in an inaccurate way, it is better (especially for those of us in education) that they make this blatantly clear. I never worry about the historical details (i.e. the US in 4000BC). What you raise here that I think is the more important thing to take out is the way Civ has an overall narrative of historical evolution embedded in it, as you point out here. The other way I think this would be useful in teaching would be to look at how Civ has evolved itself in its 5 versions (to date – and as a mac user I don’t yet have Civ 5 so can’t compare that one myself). In Civ I you really did have an exceptionally linear account of history from despotism to democracy. By Civ IV there is a much more complex account, and clearly situations at different points where there isn’t single government type, or combination of the various different civilization aspects, that is ‘best’. The relationship between technological change and historical change is also much more nuanced. It would be really interesting to know what sorts of conversations the designers have had in developing each version – I see the trace of much more complex historical sociologists (Michael Mann, Charles Tilly) in later versions than the uni-dimensional narrative in the earlier ones.